Meet the Designer - Chris grew up in the Southern Suburbs of Detroit, Michigan and in 1988 at the age of 18, started a profitable handyman service with a friend and partner before deciding to serve his country in the United States Army in August of 1991. In November of 1996 after more than 5 years in military service, he exited with an honorable discharge as well as many awards and recommendations and moved to Orange City, Florida were he started working in the construction industry. Chris then founded Weldon & Associates, Inc. in 2003 and has been helping our clients create both dream homes and commercial & investment properties from little more than an idea. Since it's beginning, Weldon & Associates, Inc. has been published in the Orlando Sentinel, contracted with a National Home Plan website & Print Publishing Company and awarded "Professional Building Designer" status through A.I.B.D. (The American Institute of Building Design). 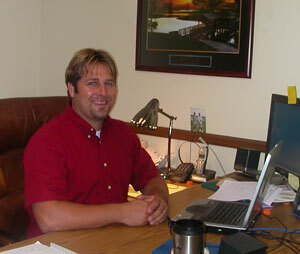 In 2007, Chris was appointed to the City of Orange City Planning and Zoning Commission. As a resident and business owner of Orange City, Chris feels it is his responsibility to help sculpt the future for generations to come. Chris also sits on the Board of Directors of Christian Care for Lil' Angels, Inc., a not-for-profit pre-school in Debary, Florida that currently supports over 120 children and growing to include special needs programs, after school care and state mandated Pre-Kindergarten programs. In 1998 Chris attended Comair Aviation Academy (Now Delta Connection Academy) in Sanford, FL and received his Private Pilots License (S.E.L., High Performance Aircraft, Complex Aircraft, and Instrument Endorsements.) and currently uses his aviation background to shoot Aerial Photography for clients around the Central Florida Area. In 2001-2003 Chris also attended Seminole Community College and received an A.S. Degree in Computer Network Design and Administration and is A+ and Network+ Certified with a background in Novell Networks and Microsoft Business & Server Networks. In 2012, Chris launched a Joint Construction Company "Smith & Weldon Construction" with friend and colleague Scott Smith. This company offers construction services from start to finish for our clients to include Residential new and remodel construction as well as Commercial New and Remodel Construction. With his well rounded background in construction and non-construction related fields, his knowledge and experience becomes a great asset to his clients and Weldon & Associates, Inc.
� 2004 Weldon & Associates, Inc. All Rights Reserved.